They're back—and they're funnier than ever! 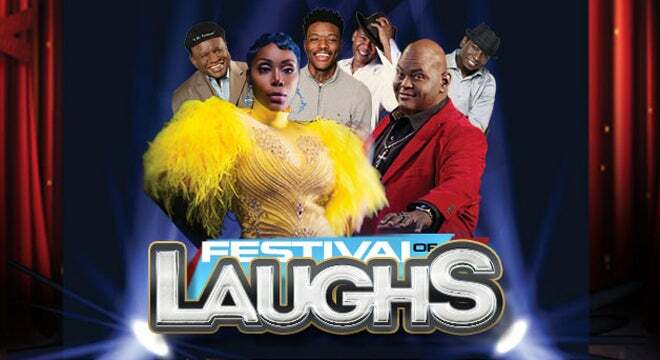 The Festival of Laughs featuring Sommore, George Wallace, DC Young Fly, Lavell Crawford, Mark Curry and Guy Torry returns to the Fox Theatre on Saturday, May 11 at 8 p.m. The veteran entertainers will bring down the house with their sharp wit, unbridled humor and hysterical storytelling for a comedy show fans won’t want to miss. Lineup subject to change. Sommore will be hosting the evening, while the star-studded cast promises to bring the laughs. In her more than 20-year career, award-winning comedian of “Chandelier Status,” Sommore, has become a trailblazer for women in the comedy business as one of the most successful comedians in the U.S. and abroad. Sommore has been featured in a number of hit films including Soul Plane, Something New and Friday After Next. She recently filmed an all-new self-produced comedy special, A Queen With No Spades that will air later this fall on Showtime. She also has another self-produced project, titled, All the Queens Men that is expected to debut on network television in the Summer of 2019. "Even in this fast paced ever changing world that we live in, laughter will never go out of style and I am so glad that it is a big part of my life,” says Sommore. Lavell Crawford gained huge national exposure on NBC’s hit reality series Last Comic Standing. Not only did NBC take notice, promptly signing Lavell to a holding deal with the network, but also Comedy Central, offering him his own half-hour standup special, Comedy Central Presents: Lavell Crawford. Lavell’s stand-out work includes appearances on Shaquille O'Neal Presents: All Star Comedy Jam, Russell Simmons’ Def Comedy Jam on HBO and Showtime at the Apollo, to name a few. George Wallace’s credits include Jericho, Think Like a Man Too, Funny People, and The Ladykillers. Wallace was awarded a Lifetime Achievement Award at the 2013 Soul Train/Centric Comedy All-Star Awards. A comedian, actor, social media influencer, musician and podcast host, DC Young Fly has proven that innate comedic ability, abundant creativity, and a passion for generating laughter in others can be translated across multiple mediums. He is a veteran cast member of Nick Cannon’s Wild ’N Out, which is entering production for its 13th season, and has brought the humor to MTV’s Total Request Live as one of its main hosts. Mark Curry is an American actor, comedian, and host. Curry is best known for his role as Mark Cooper, ex–basketball player turned teacher on the ABC sitcom Hangin' with Mr. Cooper which originally aired from 1992 to 1997. Curry served as one of the various hosts of the syndicated series It's Showtime at the Apollo. He also starred in Nick At Nite's first-ever original live-action family comedy series, See Dad Run. In the tradition of comedians who have made the transition from the stage to the screen, such as Richard Pryor, multi-talented Guy Torry has made the leap to comedic actor with great success. Guy has been seen on BET’s Comic View, Comedy Central’s Premium Blend, Showtime at the Apollo and Russell Simmons: Def Comedy Jam where he made his stand-up debut to a national audience. He created a unique concept called Phat Comedy Tuesdays which was a weekly showcase for up-and-coming comedians. This evolved into a weekly spotlight at the Comedy Store on the Sunset Strip entitled The Guy Torry Show where Guy hosts and produces a comedy showcase featuring an improv comedy troupe. This event was regularly attended by the comedy A-List including Eddie Murphy, Chris Tucker and Chris Rock. The St. Louis native also received critical acclaim for his work on the small screen starring in the NBC mini-series The 70’s, the HBO movie Introducing Dorothy Dandridge, and the UPN drama The Strip. He hosted BET’s sports talk show Baller, with four-time NBA World Champion John Salley and three-time NFL Pro Bowler Hugh Douglas. Guy has made guest star appearances on television series including Blind Justice, The Shield, One On One, X Files and NYPD Blue. He also supplied his voice on the animated Nickelodeon series As Told By Ginger. Guy has appeared in such feature films as Funny Money, opposite Chevy Chase, Penelope Ann Miller and Chris McDonald; The Last Stand, starring Anthony Anderson, Darrin Henson, Kevin Hart and written and directed by Russ Parr; Dead and Deader, opposite Dean Cain and Susan Ward, and the independent thriller Slow Burn, opposite Ray Liotta, Taye Diggs, LL Cool J and Mekhi Phifer. Guy has also appeared with Matt Damon, Greg Kinnear and Eva Mendes in the 20th Century Fox Film, Stuck on You, and his other film credits include Runaway Jury, Don’t Say A Word, Pearl Harbor, Life, The Animal and most notably American History X.